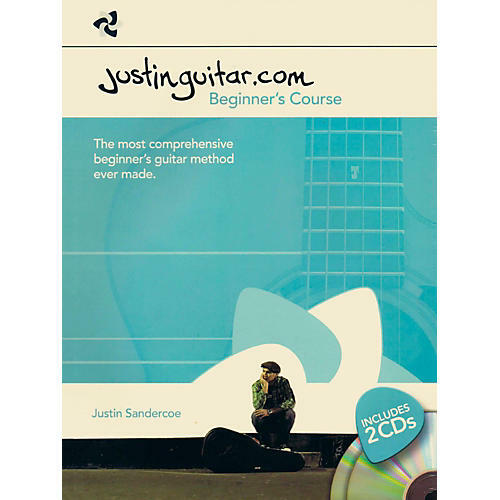 Hailed as the most comprehensive and complete beginner's Guitar method ever, the Justinguitar.com Beginner's Course from Justin Sandercoe will take you through everything from buying a guitar to basic improvisation, now including two CDs full of content. If you have ever thought about picking up a guitar, this book should be your first port of call. In renowned music teacher Justin Sandercoe's friendly and authoritative way, he takes you through the basics of being a guitarist from the absolute beginning to playing some impressive songs. You will learn all the essential chords, the fundamental scales and rhythm strumming and picking. The CDs have been specially recorded by Justin giving you demonstrations of every chord, technique and exercise to help you hear exactly how everything should sound. Justinguitar.com has been world-renowned since it was initially set up in 2003. The Independent newspaper has called him one of the most influential guitarists in history, and his combined total of 100 million viewers would certainly agree. His online videos have gained him huge recognition, but he is also a teacher at the Guitar Institute, and has taught thousands of students privately, including Katie Melua and Cathy Dennis. The course has been 20 years in the making, and has incorporated everything that a beginning guitarist needs to know, but that is often skipped over in less rewarding methods; things like music theory, aural training and songs specifically chosen to reinforce techniques learned. Speaking of songs, if you want more songs to learn as a fantastic complement to this book, check out the Justinguitar.com Beginner's Songbook. So if you've just started learning the Guitar, or you already know the basics, the Justinguitar.com Beginner's Course is the perfect way to kick your Guitar playing up to 11. With his many years of experience, you'll be in the very capable hands of Justin, who will be your faithful and helpful guide to learning the six string.